** Please note that a cleaning fee for this villa will be added to all reservations. 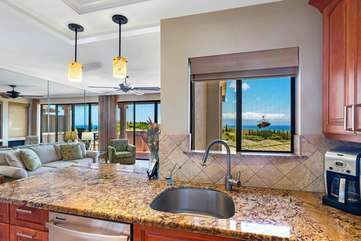 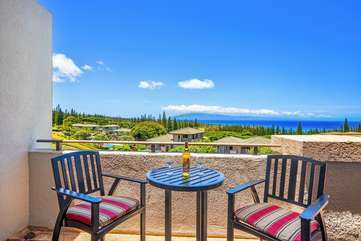 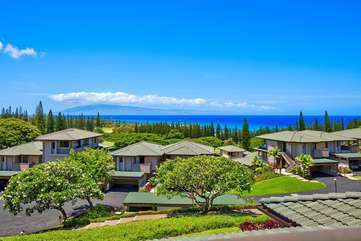 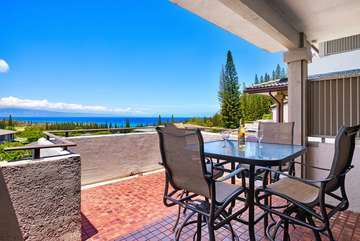 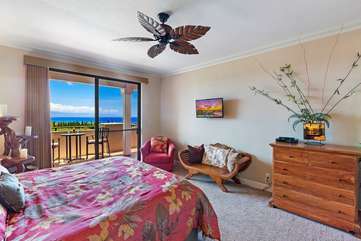 This villa, Hale Ka'ikenanani, is located inside the prestigious Kapalua Resort on the northwest corner of the island of Maui just above an impressive shoreline with a series of beautiful sun kissed beaches. 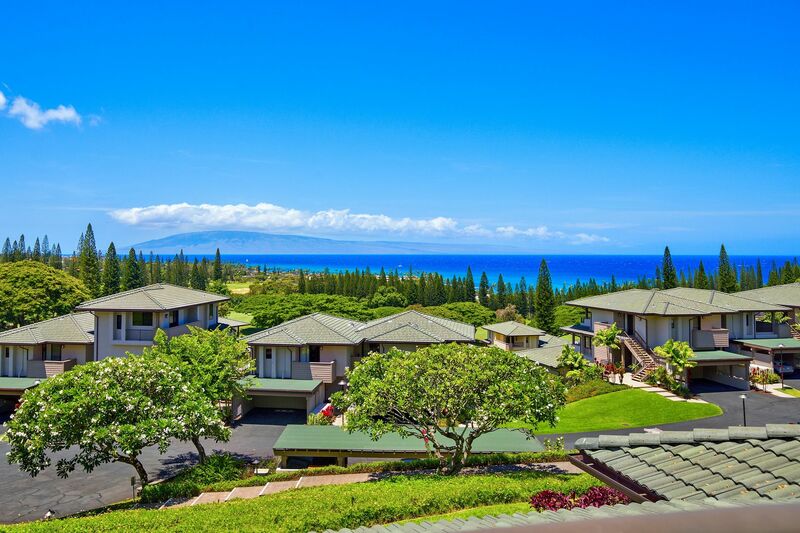 If you have been to the Kapalua Golf Villas you know the view just inside the main entrance is nothing short of incredible and most people pause there to see it. This villa is in building 21 just to the right of that entry and shares the same panoramic ocean view on the top row of the complex. 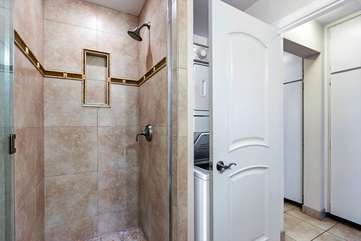 There are no stairs between the covered parking conveniently located maybe 30 feet from the front door and it is all on one level. 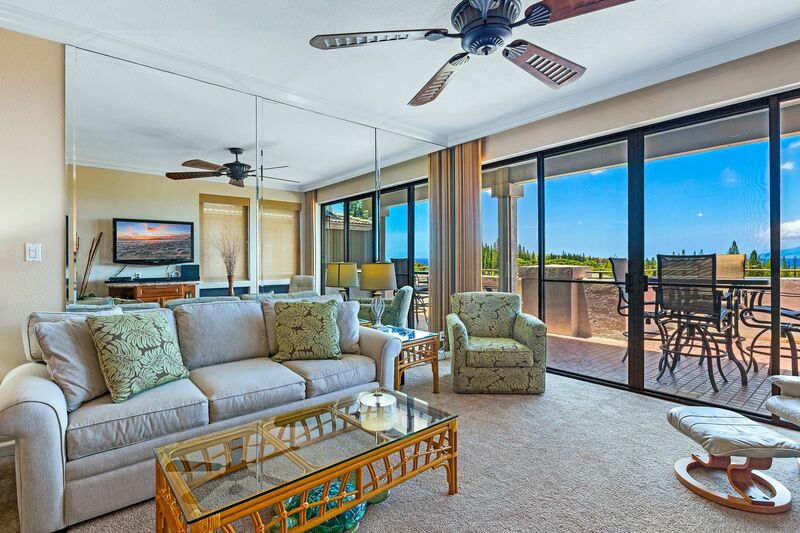 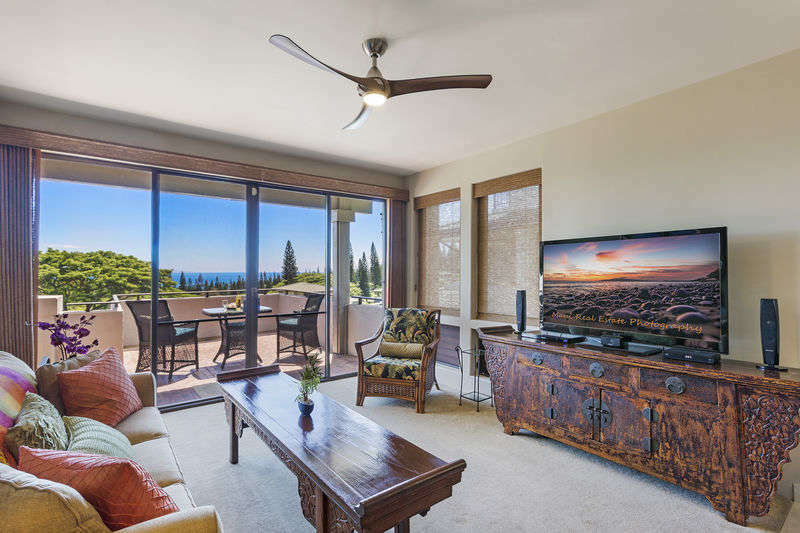 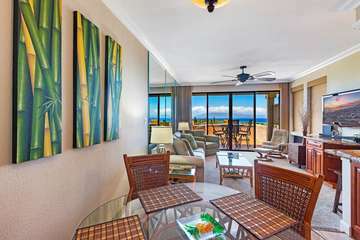 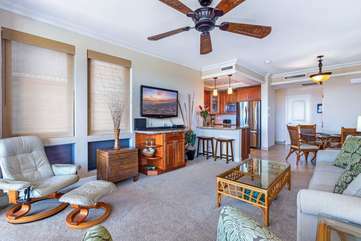 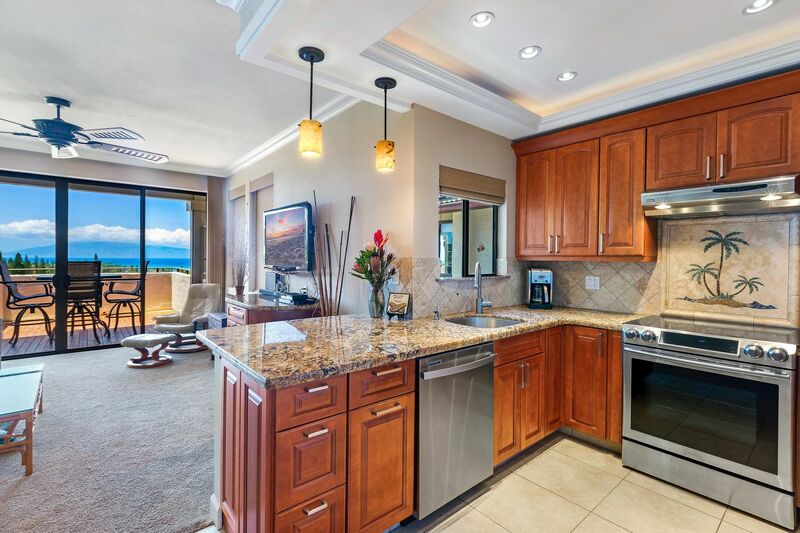 With approximately 1100 square feet and one of the largest lanais, there is plenty of space to enjoy your ocean or sunset views while relaxing inside or out. 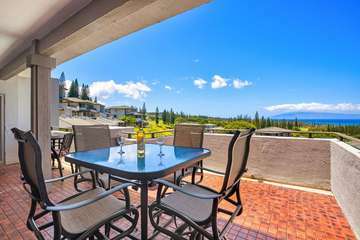 There is a nice swimming pool with umbrellas and lounge chairs, one of 4 on property, directly adjacent the end of the building. 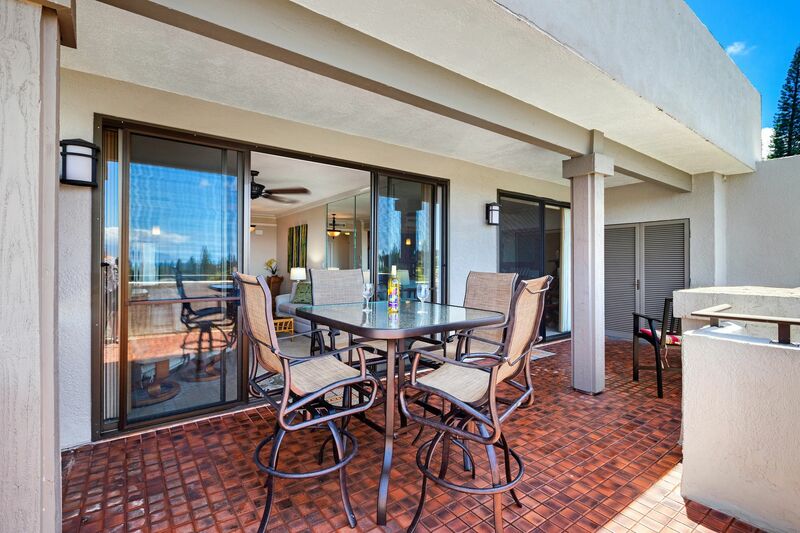 It's about a minute walk from your door with a gas bar-b-q for poolside grilling. 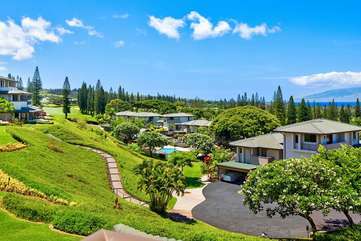 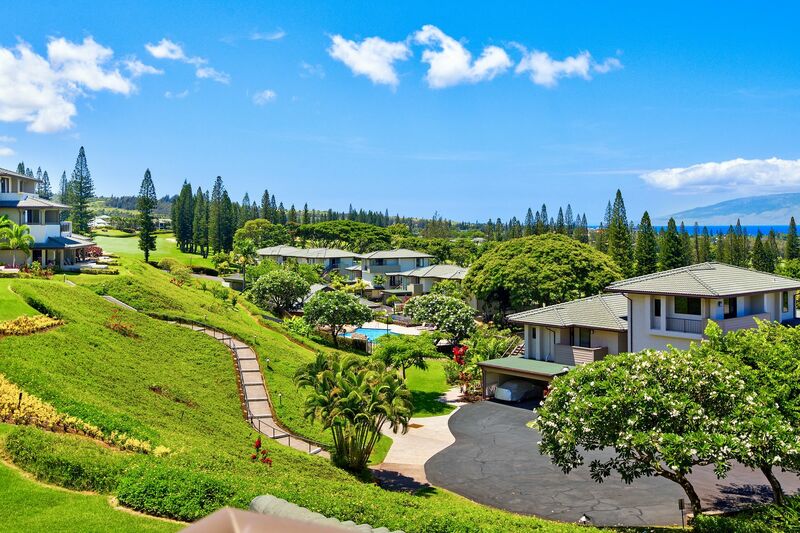 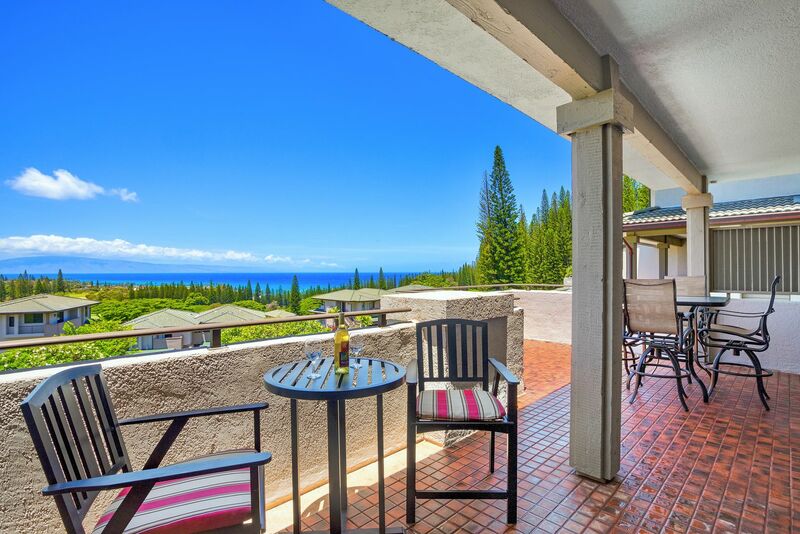 This Kapalua Golf Villa has been completely renovated and has one of a kind characteristics that "True Platinum Level Villas" are known for. One of the special features is a space alteration that offers an additional sleeping quarters about half the size of an average bedroom. It's just big enough for a twin bed and end table and room to change clothes. This extra space includes an AC vent, a ceiling fan and a window if fresh air is preferred. This provides the extra bed for the 5th person. 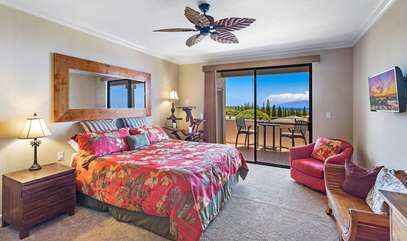 If 2 people occupy the queen sofa sleeper totaling up to 5 occupants in what is usually a villa for 4. 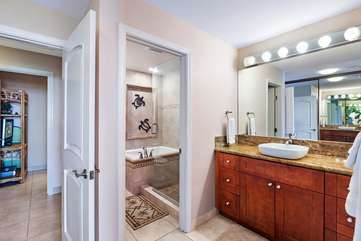 The hall bath has a standard size walk in shower if there are guests or extra family members using the extra beds. 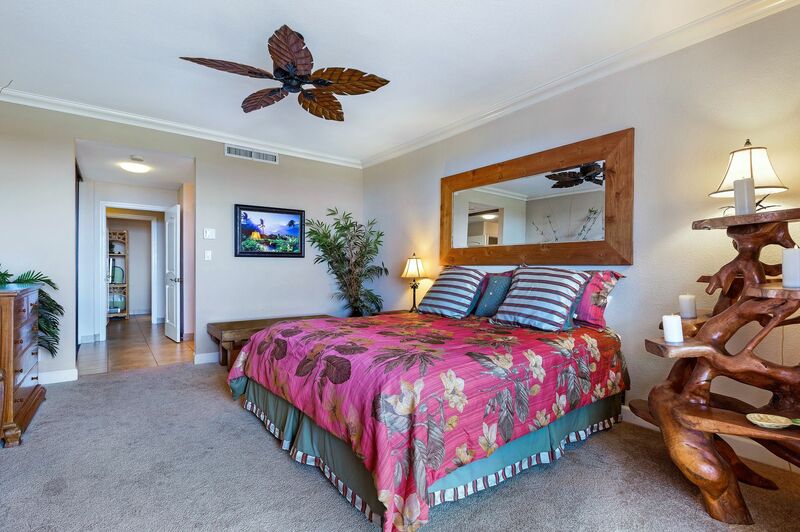 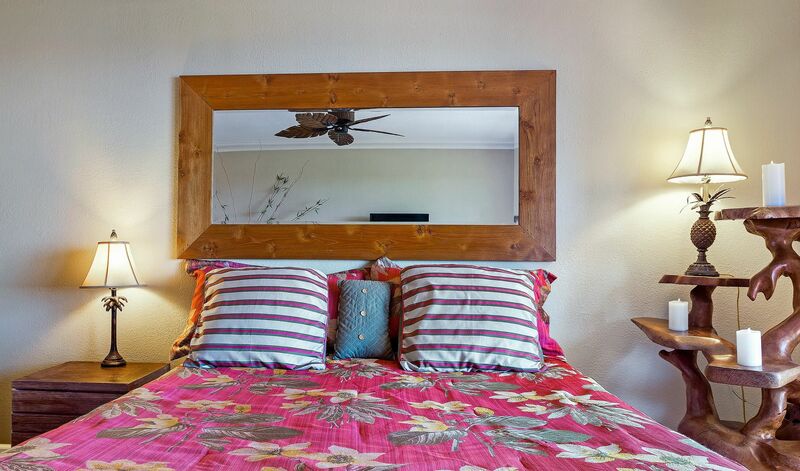 The master bedroom does have a door that shuts off for privacy and includes a comfortable king bed with clean quality linens and warm exotic teak wood furnishings and accents. 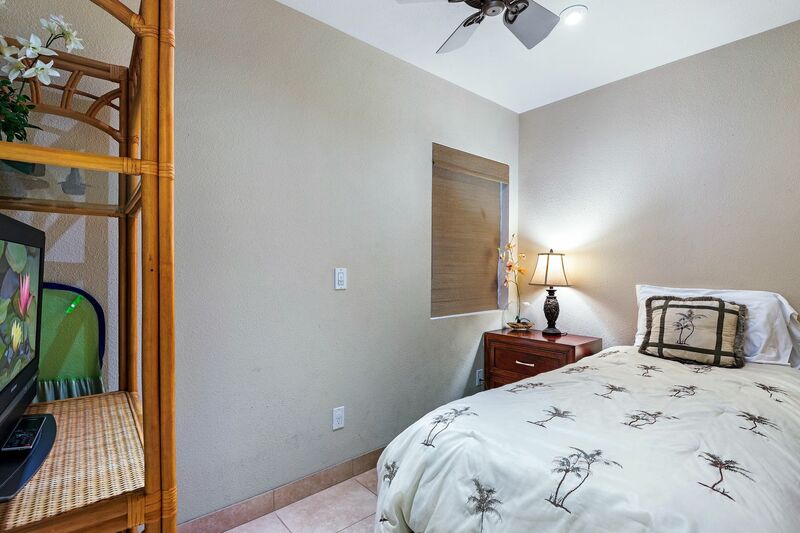 There is a black-out membrane attached to the woven wood blinds for ultimate privacy and those mornings when you want to sleep in or afternoon naps. 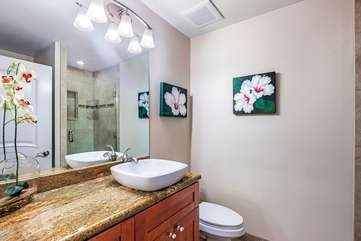 The master bath has been altered to offer a small but deep soaking tub separate from a roomy walk-in shower, so those with mobility challenges can access the shower more easily. The entire bathing area is done in beautiful travertine stone with custom accents and a glass door allowing easy access to controls. 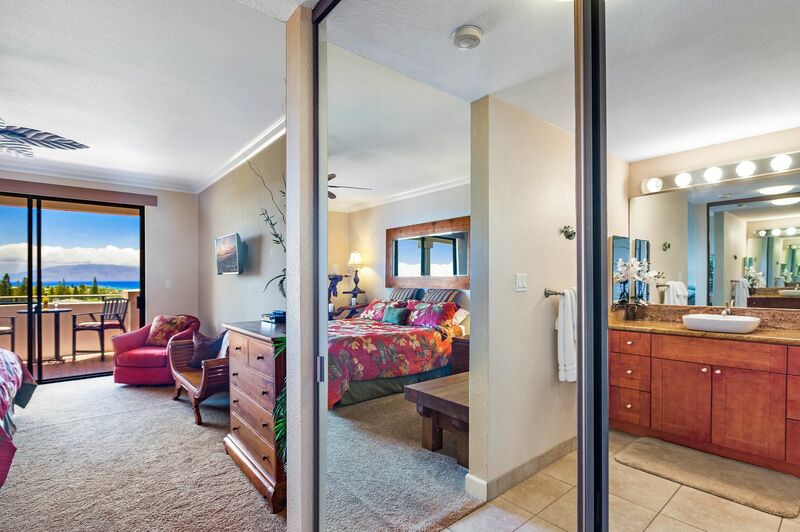 It also can be shut off from the bedroom for further privacy. 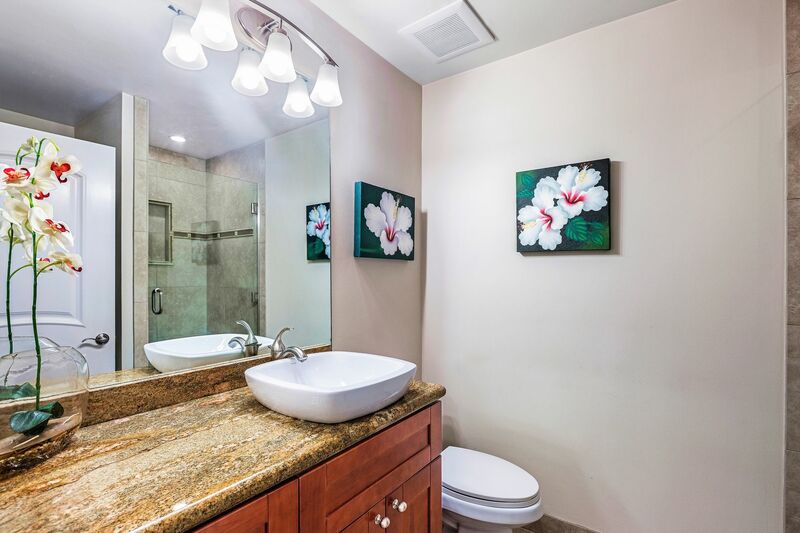 Alder wood cabinets and granite countertops with vessel sinks and Kohler faucets in both bathrooms add to the high end amenities. 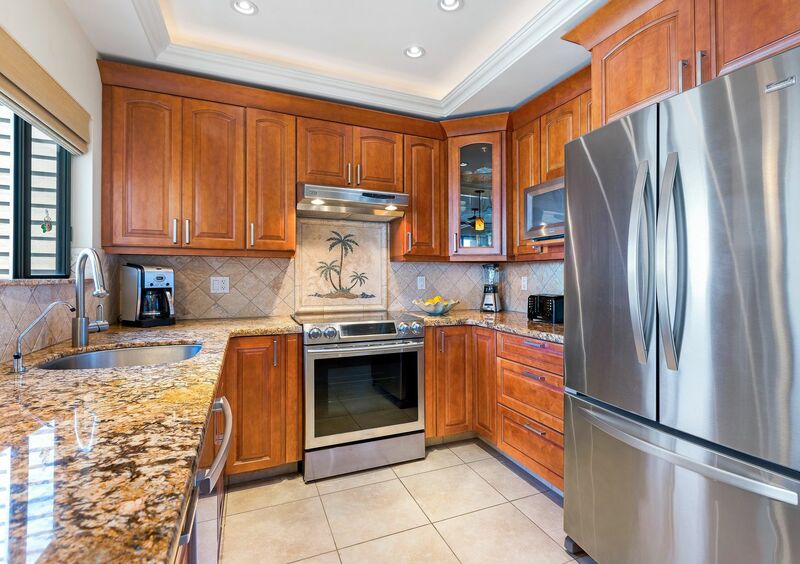 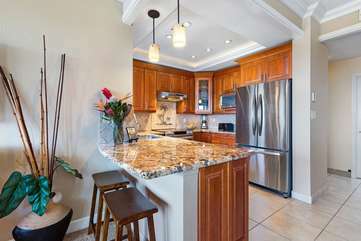 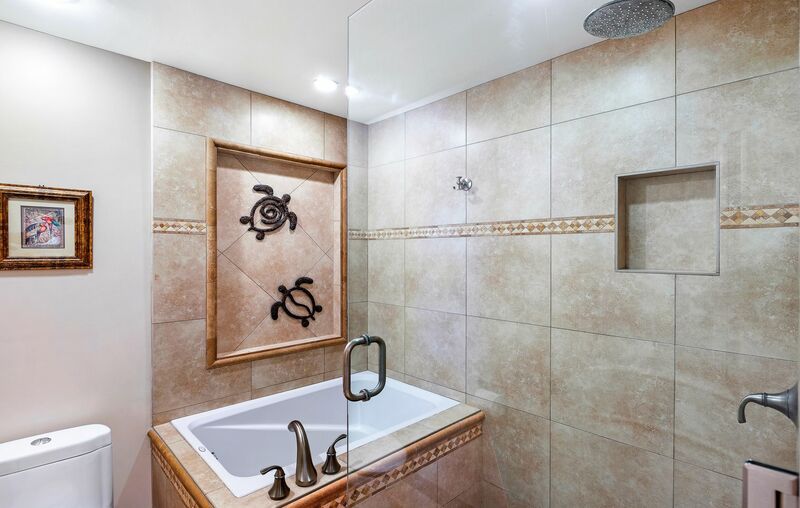 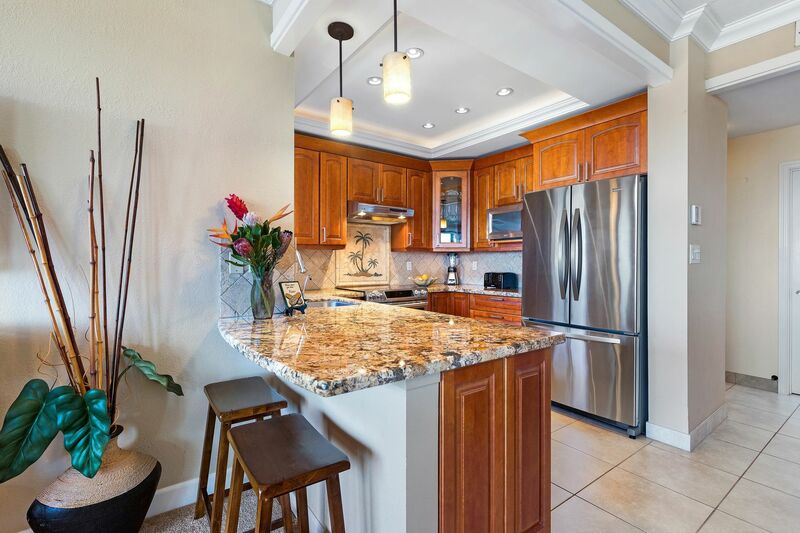 The kitchen has quality cherry wood cabinets with custom slab granite, tumbled travertine stone backsplash with a custom one of a kind stone art accent palm tree scene. 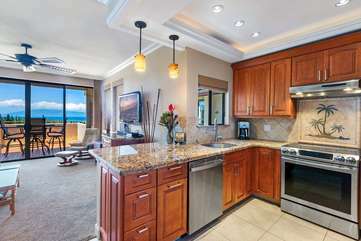 Stainless steel appliances, custom lighting accents and quality plumbing fixtures round out the well appointed kitchen that most people claim has all the housewares and features they enjoy in their own homes. 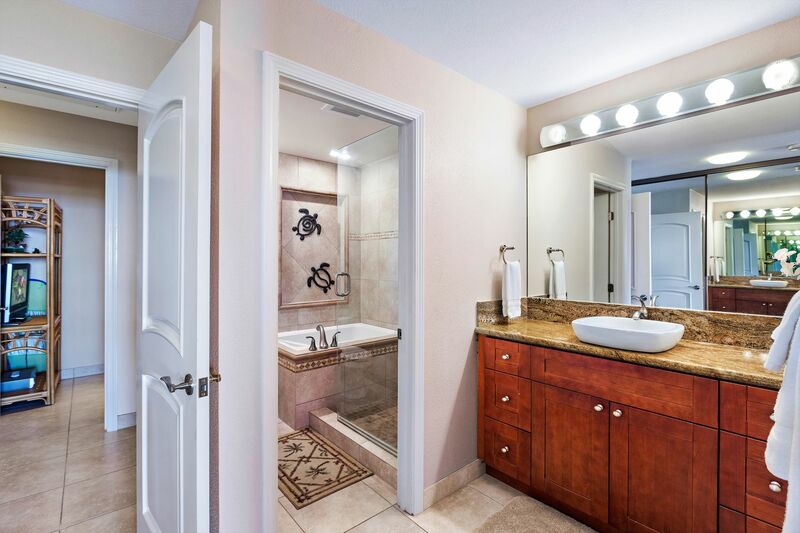 There are porcelain tile floors throughout with exception of soft quality carpeting in the living and master bedroom. 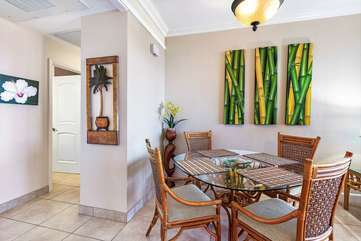 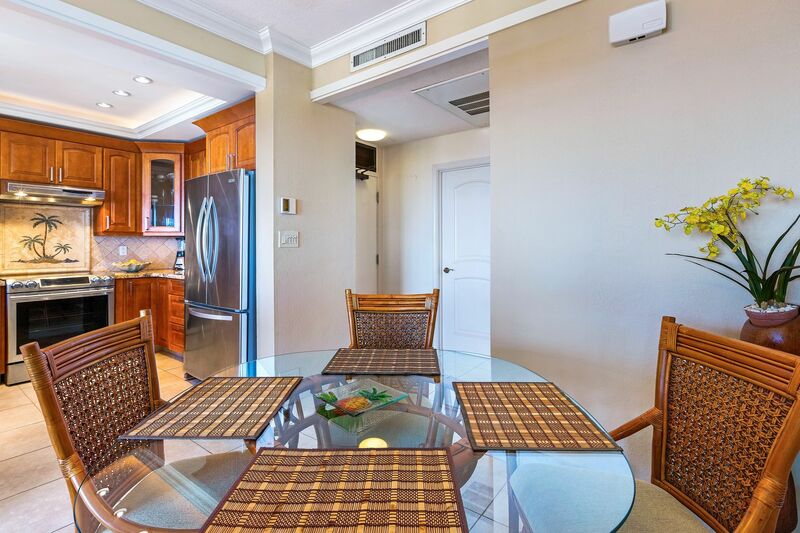 There is a dining set for 4 in the dining room and on the lanai outside with the addition of a barista set for two if there are additional guests or just two people enjoying a bottle of wine. 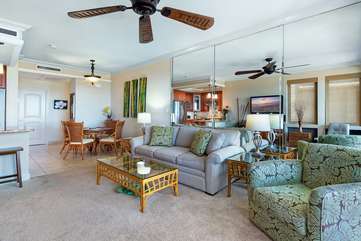 The furnishings have a tropical flair including the sleeper sofa, new in 2015, and are up to date kept in good repair. 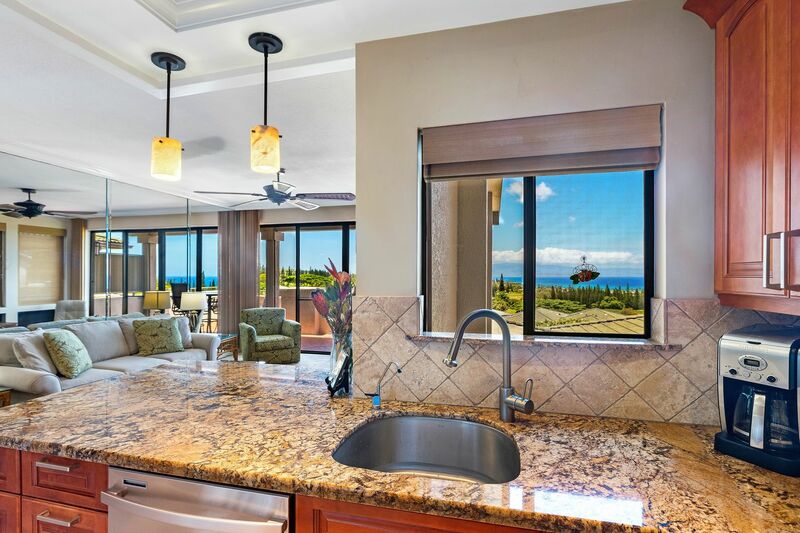 Our pictures are realistic so we encourage you to look them over closely for an accurate portrayal of this special villas features and views. 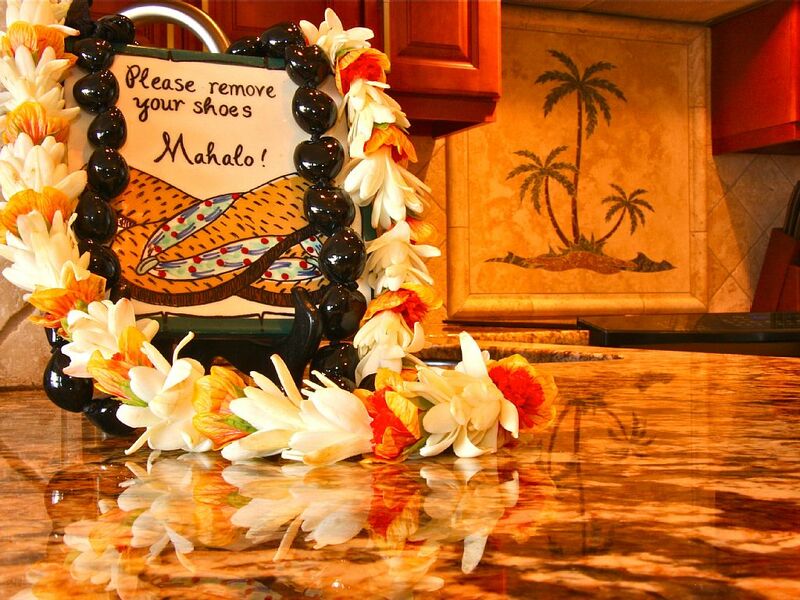 ** Please note that a cleaning fee of $175 + tax will be charged for Hale Ka'ikenanani.